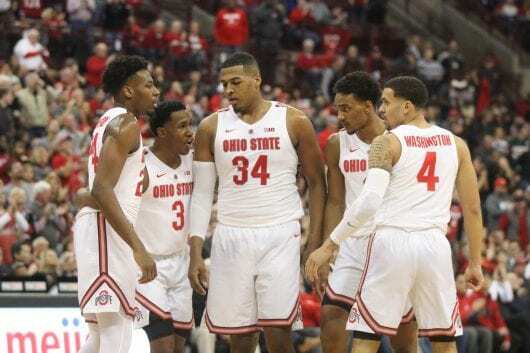 In the beginning of the season, after being picked near the bottom half of the Big Ten in preseason polls, it needed to be seen if Ohio State could be considered a top-tier program in college basketball. Early-season wins against Cincinnati and Creighton took steps to proving that, but the Buckeyes’ first ranked matchup of the season, a home game against No. 8 Michigan State, could have been that statement win to prove they are in the elite. After 20 minutes in No. 14 Ohio State’s matchup against the Spartans, the Buckeyes looked like they more than belonged, taking a 7-point lead into halftime behind a 15-5 run to end the half. But the final 20 minutes told a different story. Michigan State outscored Ohio State by 16 in the second half, putting up 50 while shooting 76.5 percent from the floor. Despite their second half performance, sophomore forward Kaleb Wesson thinks the Buckeyes have the talent to compete with teams like the Spartans, who rank No. 3 in the country after the win, according to KenPom.com. Wesson had a team-high 25 points and eight rebounds while shooting 9-of-14 from the floor, more than double the amount of points than anyone else on the team. Though Wesson believes his team is already at the level of those elite programs, head coach Chris Holtmann does not. The Buckeyes finished the game with 26 personal fouls, including five each from Wesson, his brother, junior forward Andre Wesson and freshman guard Luther Muhammad, who all fouled out as a result. This left Ohio State with a young lineup to close the game with — even younger when senior guard C.J. Jackson could not finish the game due to cramps — which included a pair of freshmen in guard Duane Washington and forward Justin Ahrens. Holtmann said he wishes he put more of a veteran group on the floor during the comeback effort, but that the experience may help down the line. For all the momentum gained through the closing run of the first half, the Buckeyes showed how limited they can be when up against a high-caliber opponent. Ohio State missed two of its final 11 shots of the field, with the sole makes being Muhammad open layups as Michigan State focused on shutting down the 3. The Spartans made eight of their last 11 shots and outscored the Buckeyes 15-5 in the final 4:53. After winning 12 of its first 13 games, Ohio State came into the game riding high, proving for a second-consecutive season that expectations for the team were set far too low to start the year. Road wins against Cincinnati and Creighton proved that, a neutral-site victory against UCLA proved that, and a sole loss to Syracuse didn’t feel like a big step in the wrong direction. But Holtmann knows there’s still much to be done to bring his program to an elite status, and the defeat to Michigan State proves, as Holtmann said, that it’s not there yet.